A reading log is a great tool that assists teachers, parents and children. As early as first grade, both of my children were required to complete a reading log as part of their homework. As a result, we’ve created free, printable reading logs ideal for a child in elementary school. The following reading log formats are commonly used in our elementary school. Our school requires each student to read for at least 20 minutes a day and the reading logs below are used to track each student’s progress. They are distributed on Monday and due on Friday. This reading log is arranged by day; it contains a section for each homework session – Monday, Tuesday, Wednesday and Thursday. It also contains a section for a title, author, pages read and parent’s signature. 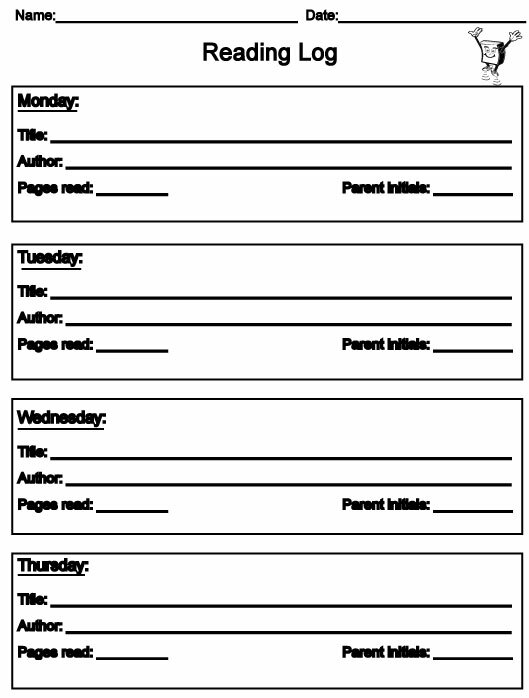 This reading log is very similar to the one above except it put a box around each homework session. This reading log is very similar to the ones above except it does not contain instructions. If your reading program has a different reading requirement, e.g. 15 minutes, use this log. Below please find several daily reading logs ideal for a 2 week homework cycle. These reading logs should be distributed to students on Monday and are due the following Friday. This reading log contains the following sections: days of the week, a title, number of minutes and parent’s initials. The instructions are as follows read for 20 minutes every night. This reading log contains the following sections: days of the week, a title, author, number of minutes and parent’s initials. The instructions are as follows read for 20 minutes every night. This reading log contains the following sections: days of the week, a title, number of minutes and parent’s initials. The instructions are as follows read for 20 minutes at least 8 days during this homework period. This reading log contains the following sections: days of the week, a title, author, number of minutes and parent’s initials. The instructions are as follows read for 20 minutes at least 8 days during this homework period. This reading log contains the following sections: days of the week, a title, number of minutes and parent’s initials. It contains no instructions. This reading log contains the following sections: days of the week, a title, author, number of minutes and parent’s initials. It contains no instructions. This reading log contains the following sections: date, title, number of minutes and parent’s initials. It contains no instructions. 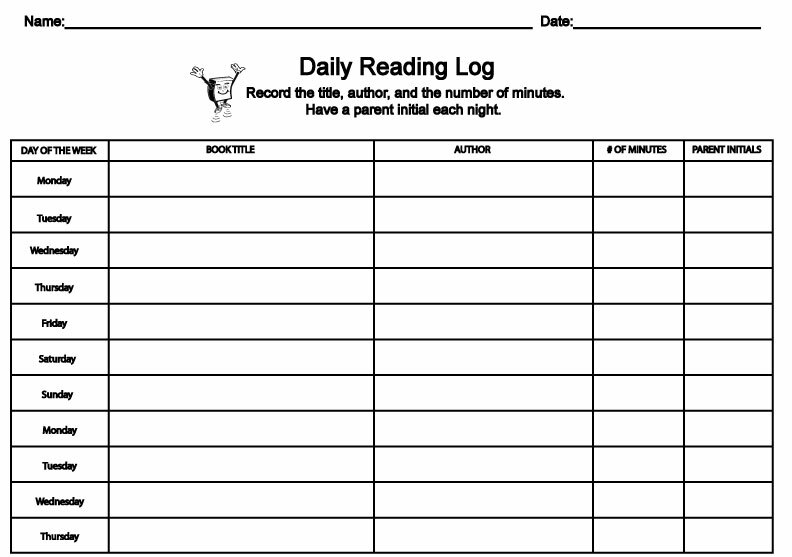 This reading log contains the following sections: date, title, author, number of minutes and parent’s initials. It contains no instructions. These reading logs do not specify a day or date. This reading log contains the following sections: title, number of pages and parent’s initials. It contains no instructions. This reading log contains the following sections: title, author, number of pages and parent’s initials. It contains no instructions. This reading log contains the following sections: title, author and number of pages. It contains no instructions. This reading log contains neither sections (just blank lines) nor instructions. If you would like to track a child’s reading, at a high level use these monthly reading log templates. This reading log contains a blank monthly template. This reading log contains a monthly template for January. This reading log contains a monthly template for February. This reading log contains a monthly template for March. This reading log contains a monthly template for April. This reading log contains a monthly template for May. This reading log contains a monthly template for June. This reading log contains a monthly template for July. This reading log contains a monthly template for August. This reading log contains a monthly template for September. This reading log contains a monthly template for October. This reading log contains a monthly template for November. This reading log contains a monthly template for December. This looks good for me I’m only in 5th grade and could help me because I have A.H.D. thanks a lot for make busy parents’ live easier!